I let myself get caught up with several of the new Google+ Communities over Christmas break. While I’ve mostly been seeing a lot of cross-posting by some of the bigger “ed tech” heavy-weights spamming opportunities and interesting articles across several communities (mostly good mind you), there have been a few bright points of conversation, most of them stemming from Steve Hargadon’s Education Revolution community. In addition to exploring the wonderfully reflective questions and conversations that Steve can induce in most corners of the Internet, I also signed up for #ETMOOC, one of those trendy Massively Open Online Courses with a twist; it’s taking a desegregated approach to conversation and learning in that all of the participants will be blogging on their own individual websites and blogs, with the results being syndicated through a central hub. It’s very much akin to DS106 (it should be as they’re both sharing the same technical expertise of Alan Levine), and is attempting to allow each of the course members to have their own distinct voice, yet curate them into one gigantic stream of narration. I predict a massive conflagration of learning and blogging, but there was one hurdle that took me awhile to overcome while going through the course’s pre-orientation check list; Introductions. Like a good constructivist-based course, the first goal of the instructors (led by Alec Couros) is to get us all connected, introduced to one another, and feeling comfortable. To that end, they setup a Google+ Community for us to have a centralized common “class discussion” area in addition to our blogs. Many people have introduced themselves with links to their blogs, brief descriptions of what they do, and where they live, but after starting (and stopping) several time to craft a succinct introduction post, I gave up. The course itself is a study of Educational Technology and Media, so I shifted gears, opened up Photoshop, and took a page from one of my old media creations on introducing oneself. Thus far, the “Hello” poster that I created has been warmly received, which was a huge relief to me. Most of the other course participants hail from universities and institutions that make it their business to teach and facilitate others about the use of media and technology in education, so receiving their nods of approval was great validation. How much time did I invest in my introduction image versus a traditional “Hi, I’m Ben” post on the forums? A LOT! Was it worth it? Hopefully, yes. A large portion of educators talk and talk about media, yet a lot of us seem to keep coming back to share through just one form of it….text. Don’t get me wrong, that’s not a bad thing! Text is comfortable, re-assuring, and highly accessible by many (the image I created is terrible for those with visual impairments), not to mention that ability of it to be translated into other languages via simple and free software. It’s just that the more I find myself working with a variety of media in classrooms while helping teachers and students, I discover that the fidelity I can create with that same media pales into comparison with the level of writing that I would like to pretend I’ve achieved. 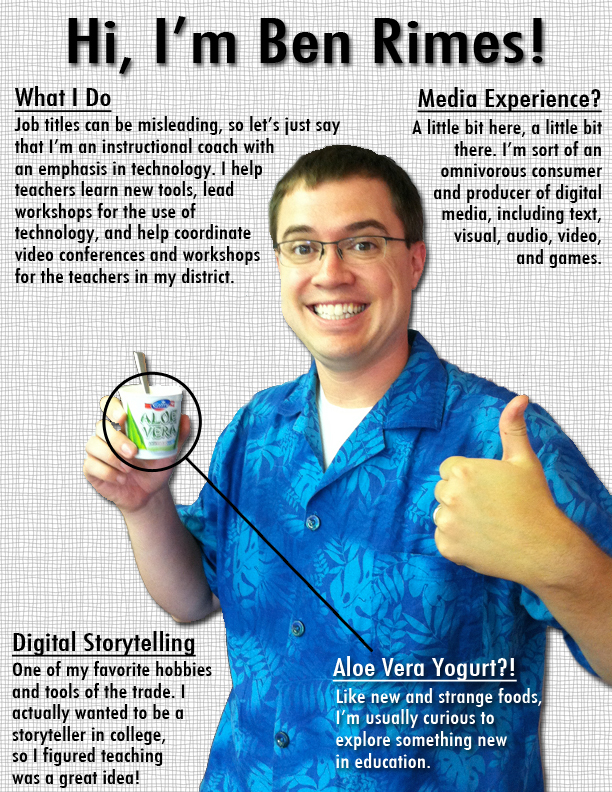 Thus, my first foray into a course on media begins with a media creation that mixes both text and visual elements…..and a small container of aloe vera yogurt (it tastes about as good as you’d think, but I’m usually excited to try new things). It wasn’t that hard either. Just a few minutes with Photoshop, the eraser tool, and the text tool. I could do without the background layer, and drop shadows on the text, as that’s what took me the longest trying to get the “perfect” look to the piece. I’m not going to do a “how to” on this one, although Brian Bennett might chastise me for it. Instead, I’ll link to my previous “What’s Inside Ben Rimes” poster that I created a year and a half ago as a similar way of introducing myself to the DS106 community. I’ll end simply not by linking to some new app or website that you can create your own introduction image, but rather a challenge to actually open up Microsoft Paint, Preview, GIMP, or some other visual editing tool (heck, even Word or Pages would work), and create your own “introduction poster”. It’s certainly not going to be high art, and my creation isn’t the best piece of media I’ve created, but you have to start somewhere, and saying hello is certainly a good place to do it, right? The image is a fantastic way to introduce yourself. Online teaching/learning is all about social presence and you’ve definitely hit on that in spades. You aren’t just talking about #edtech your demonstrating it and doing it in an engaging way. I like it a lot! Love the post, Ben. Great idea. Visual communication is such a great medium, especially in today’s visually oriented society. I’ve been teaching online courses for teachers and adults for a year now through MSU and REMC Association. After enduring far too many of the soul-sucking “respond to original forum post, then comment on three other submissions” assignments, I needed to start having fun. Since I’ve only been an instructor, not a course designer, I have very little control over the content. Being able to craft an identity online, and try to connect with my online learners has been good for me. Hello Ben! I imagine that I am a relative who came to stop in Latin America specifically in Brazil. I really enjoyed your post. Congratulations!